2015 has not been a good year for emerging market currencies. An economic slowdown in China, plunging oil prices and an imminent Federal Reserve interest rate increase have caused a mass sell-off in emerging market currencies across the board. Currencies such as the Brazilian Real and Turkish Lira have suffered further from political turmoil, while others, including the Russian Rouble and Ghanaian Cedi, have experienced unprecedented levels of volatility and violent shifts in investor sentiment. Many, including the Malaysian Ringgit, South African Rand and Mexican Peso, have even plunged to all-time lows, compounded by the decision of the People’s Bank of China to devalue the Chinese Yuan in August. JP Morgan’s emerging market currency index has recently fallen to its lowest on record, having declined by over a fifth since the beginning of last year alone. Which currencies fared the worst? Below, we have listed the top 10 worst performing emerging market currencies (Source: Bloomberg Date: 14/10/2015) covered in our latest Emerging Market Report. The Brazilian Real tops the list, having lost a staggering 31.5% of its value so far in 2015 alone. Secondly, the extent to which the recent sell-off already devalued the currency and whether this is enough to increase competitiveness and compensate for any deterioration in the terms of trade. In our view, the recent rout in emerging market currencies has been completely excessive and unjustified in most cases, made worse by outright panic and a clearing out of stale trader positions. The value of most emerging market currencies has now began to normalise and we anticipate most returning back to levels better justified by their economic fundamentals. We expect the Brazilian Real and South African Rand, in particular, to recover, with the Turkish Lira remaining vulnerable, given the ongoing bleak economic outlook in the country. 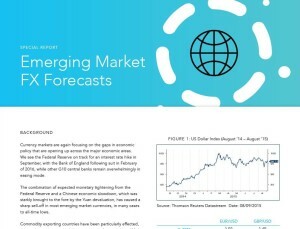 For further analysis of all the emerging market currencies featured, download our detailed research report.